I have so many things to be grateful for. The Lord has blessed me so tremendously and continues to do so on a daily basis. 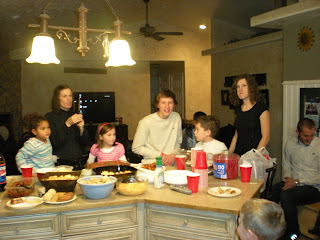 But, over the last few days my poor heart has been aching for Jonathan's cousin Audrie and her son Kristoffer who is 5. For some of you this story is a repeat but for others, it is not. So, I will tell it in my words but will also give you the link so you can here it in Audrie's words. About a week ago her son was running a temperature and said his stomach hurt. So, she took him into Instacare and they ran an xray of his stomach and found a mass. From there they sent her to the ER and that is where they ran a CAT scan and found a large tumor on his Kidney and some spots on his liver. The next day he was flown to a hospital in Phoenix where they took a biopsy of the tumor. He is now in Albuquerque so they he can be closer to home. It is a very fast growing tumor and so they are starting chemo treatments for him tomorrow. It is heartbreaking to me that she has got to make such hard decisions for her 5 year old little boy. Haylee and Kristoffer are just 3 months apart in age. Now that Aubrey is sixteen we as parents feel that it is our duty as her custodians to make sure that she feels safe and taken care of on the dates she goes on. I remember all to well some of my own dating experiences and so I want to keep her out of some of those situations if at all possible. So, we were talking with some of our good friends Roger and Larin. She told us of the dating contract that each of the boys had to sign before taking her or any of her sisters out. Well, we got it from her dad and put a little bit of our own into it. At first Aubrey did not like the idea. But, I think she has finally gotten used to it and doesn't seem to mind it. Anyway, here is the contract. Tell me what you think? • The defender will physically protect and defend said daughter from any situation fraught with peril (i.e., shady characters, associates involved with smoking, drugs, or alcohol, friends involved in moronic behavior, etc.). • The defender agrees to pay for all "damages" encountered in the course of the date. Damages can consist of meals, transportation, sporting events, entertainment, accouterments (flowers, candy, perfume, bribes for the father/mother, etc. ), however, NO live animals nor rings will be accepted! "Dutch" dating may be agreed to before hand. • The defender will protect and promote virtue at all costs. defender will not engage in a goodnight" kiss with said daughter during the course of the date. At the end of the date, a goodnight kiss on extremely rare occurrences (approximately once every 33,414 dates) may be exchanged. Kiss will be exactly the kind given to his mother. Examples may be asked for! A peck on the cheek or a quick kiss on the lips of less than 3 nanoseconds duration may qualify. In addition, holding hands is limited to situations requiring chivalry (crossing the street, escorting to dance floor - father cannot think of any other examples!). Holding hands while walking in the park, walking to class, walking in the hallway or any other situation which causes other boys to view said defender and daughter as an "item" are strictly prohibited. • Defender will have said daughter returned to her home by curfew. Curfew is 10 PM on weekdays and 11:30 PM on Fridays or Saturdays. Earlier arrivals are encouraged and looked upon favorably by said parents. Curfew requires said defender to vacate premises (no hanging around here after curfew!). Any suspected violations must be phoned in to the parents for notification and/or approval. • Never acting like a jerk (as far as within his power!). Refereeing season has started. I reffed 4 games last night and by the time the fourth game hit, I was already hurting. My muscles in my legs just ached. I wondered how I was going to get through the fourth game. Luckily, it was a blow out so not a whole lot of running was involved. "Your body is really quite wonderful. During what is called the implantation phase of a pregnancy (the time when the ovum and sperm have joined and it is getting settled into the uterus) the development of the zygote is extremely fragile. Your body is in an amazing race to get the zygote implanted so that it can develop into a fetus. Your body understands this reproductive process far better than we can and it produces hormones to make you tired so that you will take it easy and you will rest - this helps to protect the fragile life that is getting settled in your womb. We're a society that is constantly on the go so the constant feeling of tired can be really annoying. But as the old saying goes, rest is often the best medicine. You need the rest so that your body can utilize the extra glucose for the baby. It needs it to fuel development and so once you know that the line has turned pink, it's important to plan for some rest time during your day." Anyway, I really am looking forward to when I start feeling normal again. Okay So Lots has happened since the last time I blogged. Christmas, New Year's and Haylee's birthday. 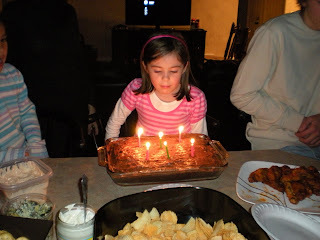 Her birthday falls on December 31st. She was my New Years baby and made it with 45 minutes to spare. She is such an amazing joy to my life. She constantly tells me how beautiful I am. I can wake up in the morning, have bed head and she says "mom you are beautiful." I really enjoy being her school teacher this year. I get so much satisfaction out of helping her learn all kinds of new things. She has a great sense of humor and comes up with some of the funniest things. Lately most of them that she comes up with have to do with babies and her ideas of how they get in my tummy and come out. HILARIOUS!!! 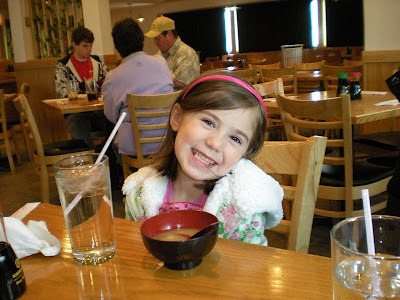 So, on each of the kids birthdays they get to choose a favorite restaurant to go to. 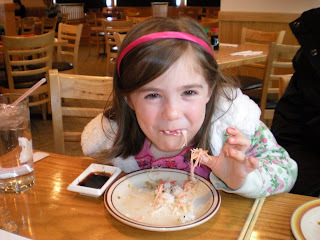 Haylee chose to go eat sushi.. 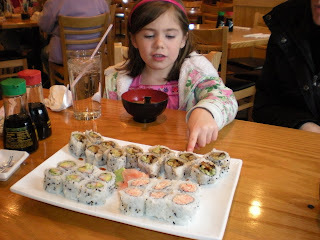 Yes, sushi is her favorite. 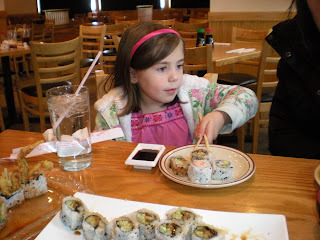 She got to choose what she wanted and she said that the dragon roll was her favorite. Than we decided to go clothes shopping so she could choose out her birthday present. 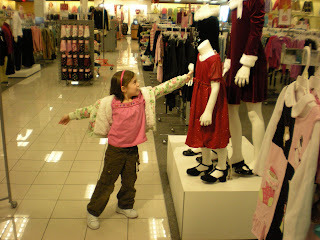 We went to three stores before she could find something that she actually liked. She is very picky and knows exactly what she wants. So if we couldn't find it, we went to another store. To end the night we went to my cousin Amy's house for a fun New Year's/Haylee's birthday party. We all sang her Happy birthday. It is such a treat for her because there is always such a big crowd at her party.